Chichester’s Politics, Philosophy and Ethics degree offers a unique approach to understanding the most compelling and long-standing questions of society, morality and existence. This programme is split equally between Politics and Philosophy departments, so academic experts in both disciplines will teach you. I like studying Politics as a joint degree at Chichester because combining the two adds new dimensions to my understanding of both, and the relatively small classrooms allows for a more personal academic experience. You will explore questions of social justice, bio-ethics, and the nature of truth from different historical and contemporary philosophical perspectives. You will also be introduced to contemporary political issues, from political economy to security studies, and have developed the analytical skills and research abilities that will serve you well in the world of work. By the end of this degree, you will be an authority in the complex and complementary relationship between Politics, Philosophy and Ethics. This three-year course (full-time) is structured around four thematic strands of study: British Politics, International Politics, Defence and Security, Political Thought and Practice. You will receive a solid grounding in the theoretical approaches and research methods in Politics, and will have the opportunity to complete an individual research project under the personal supervision of experienced researchers. The course is designed to develop both your transferable skills and subject specific knowledge. You will learn, through the tutorial experience, to read and study key texts in detail, to think critically and analytically about important ideas and issues, and to write knowledgeably and attractively about questions which matter to you and to society. You will also learn about philosophical and ethical ideas. 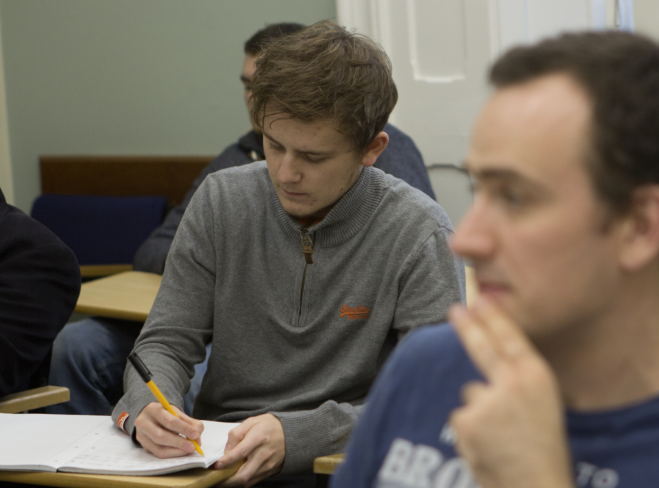 This degree’s specialist focus on Politics, both from a real world and an academic perspective, is particularly useful for careers in the Civil Service, International Organisations, Non-Governmental Organisations, Defence and Security, Public Administration, Law and Business, as well as for postgraduate research. We pay an enormous amount of attention to your future career choices. In an ever increasing range of work contexts ethical, philosophical and religious knowledge is a highly prized asset. Ranging from HR departments which need to know about ethical diversity and equality to the media which must understand religious opinions and ethical commitments to the well-known shortage of RE teachers in schools there is a great demand for our graduates. We understand the importance of ensuring that you have the knowledge, skills and experience to compete successfully in today’s challenging jobs market. As such, we offer an extensive range of study abroad opportunities. You will have the chance to take one semester of your Politics programme outside of the UK. Our long-term associations with university partners in Europe, the USA, and Canada mean that we’re well placed to offer you a further international dimension to your undergraduate experience. Year 1 examines in detail the place of philosophy and ethics in the contemporary world. You study the ideas of the new atheists, such as Richard Dawkins, ethical issues such as how to live a good life, as well as the interaction between religion, ethics and contemporary culture. In year 2 you can develop your specialist interests by studying modules in ethics, such as bio-ethics or major ethical thinkers, as well as philosophical issues and questions. You also have the chance to undertake a work or schools placement in year 2. In your final year you undertake a dissertation in a subject of your choice alongside further specialist modules in philosophy and ethics. Students are offered excellent choice and high quality specialist teaching.